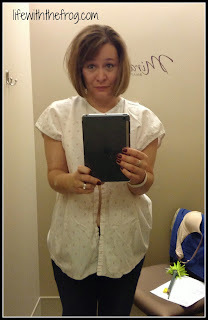 Last week I had my first mammogram. It is recommended that women have their first - or baseline - mammogram at age 40. I am 43. Sure, I have excuses for why I haven't had this scan sooner. A month after I turned 40, Joey died, and then I was grieving. Three months after that, I got pregnant with Edgie. And for two years after that I was nursing him. Sooo, it just never happened. He stopped nursing about six months ago, and since that is the recommended amount of time after weaning to wait before having a mammogram, I knew it was time. I am a small A cup - I have heard women say it hurts more when you are small. Someone was going to be touching me - and not in a fun way. And duh - it's a test for cancer. That's always scary. Luckily, I didn't have too much time to think about it because shortly after my other annual exam, the mammography department called to schedule my scan. I was told not to wear lotion or deodorant as these can flake off on the machine and cause a false reading. I was led to a changing room, told to undress from the waist up, and wear the mini gown with the opening in the front. Then I waited. A nice mammography tech came to take me to the room where I'd be having my scan. First, she asked me several questions about my health history and habits, then she told me all about the test and what she would do. She really put me at ease. The actual scan was very short - only four angles. I stood in front of the machine while the tech manipulated my arms and breasts in the places they needed to be. And honestly? It didn't really hurt. Yes, there was pressure, but no more than when Edgie, my toddler, crawls all over on top of me. If you can handle 28 pounds of toddler crawling on top of you, you can handle this. And that was it. I was given a sheet to sign into a secure site where I could read my results, but I knew the next day. I got a letter in the mail saying my scan was negative. Whew! This is one time in a woman's life that it's good to hear that there's nothing special or remarkable about her breasts. I think having a mammogram is one of those things that women tend to put off. They make excuses as to why they don't have time (cough, me, I know! ), but perhaps they are really a bit scared - of the pain, the embarrassment, or the possibility of breast cancer. Breast self exams (BSEs) are the first line of defense in catching and preventing breast cancer, the second most common cancer in women. Learn how to perform one and repeat every month. Some women's breasts are naturally more lumpy or fibrous. Avoiding caffeine may make them less so. Women who have a family history of breast cancer, have never had children, who started menstruating early, or who take hormone replacement therapy or oral contraceptives are at a higher risk. Breast feeding reduces your risk. A 3-D scan can significantly reduce the possibility of having to come back for a second scan due to discrepancies in the scan. There may be an extra cost of $75 or more that your insurance won't cover, but according to a mammography tech I know "it's so worth it." She reports that their call-back rates for second scans have been reduced by at least 30%. As with any cancer, your risk lowers if you are not obese and eat a healthy, low-fat diet. If you have been putting off this particular test and you are 40 or over or have a risk factor for breast cancer - GO GET IT DONE! It is not a big deal. Early screening can save your life when it comes to this type of cancer. You have a lot of living to do, girl - don't let fear, embarrassment, or nerves get in your way. You can search for free or low-cost screenings in your area here. Remember, it only takes about ten minutes and the pain is very minimal. Your life, your health, your family, and your future goals and dreams are worth it! !